This is a sponsored post written by me on behalf of APU as a sponsor of the BlogU conference. It took me seven years to earn a four-year degree. Hold your applause while we do some math. I completed my entire adolescent education in 13 years, from ages 5–17. It took me more than half of that time to get a BA in English. I’d like to tell you I took so long because I had to work to support my family who, in a tragic turn of events, had to sell the farm and try like hell to make ends meet in a modest, but aging ranch home where myself and 12 siblings, plus one scrappy little dog, came together and turned our misfortune into the Great American Success Story (theatrical adaptation coming to theaters this Thanksgiving). The truth is that I just couldn’t focus. I worked some and buried my father some and took only 12-credit semesters some. There were whole semesters that I opted to work fulltime at what should have been a part-time job. There were, later, whole summers that I crammed as many credits as possible into my course load so that I could finish before a decade slipped by. Sometime between stepping into my first class (French, oh la la! Sacre bleu! Zut alors! Fries!) and my father's death when I was 20 and my desire to earn money for things like gas, food, and course books—I forgot to take classes. I was a paradox of sorts. Paradox is a word I learned in college. It means, roughly, "I’m trying to sound like I’m complicated and interesting." I was a bright student who preferred not to study. I'd hoped I was just "bored." It's a term that parents use to describe their underachieving, homework-ignoring children. "He's just bored in class! That’s all. If he were more challenged he'd do his times tables." But I was not bored. I was not that bright, either. I was just not ready to be a full time student. I was the collegiate version of Office Space’s Peter Gibbons. I just wasn’t gonna go. Turns out you still have to pay, even if you don’t play. And by play I mean research themes from Milton’s Paradise Lost. Which, I actually did do. It was Personal Finance I skipped out on, and thus all the school debt. As an English major I’m qualified to point out that is called "irony." Now, though? If I had college to do over in this day, at this time? I'd take classes online. I could work and study. I could take a few classes at a time on my schedule, instead of what I opted to do, namely, sign up and pay for a full schedule but fail to attend class. If I could relive my co-ed days today, I might try some new-fangled distance learning. I might take American Public University’s diverse offerings so that I wouldn’t have to choose between working and learning, between ill-advised partying or 8 am classes. The truth is, with the advent of internet-based technology, virtual classrooms are keeping pace, sometimes even outpacing the traditional college experience. But I can’t undo my damage. At least, not until I finish paying off the last of my Stafford Loan sometime in 2026. But you, yes, you in the Starbucks with the spotty Wi-Fi and the good part-time job or you with the kids and the unfinished degree or you with the entrepreneurial bent and the newly launched cupcake business (or whatever, I just like little cakes)—you can learn from my mistakes. 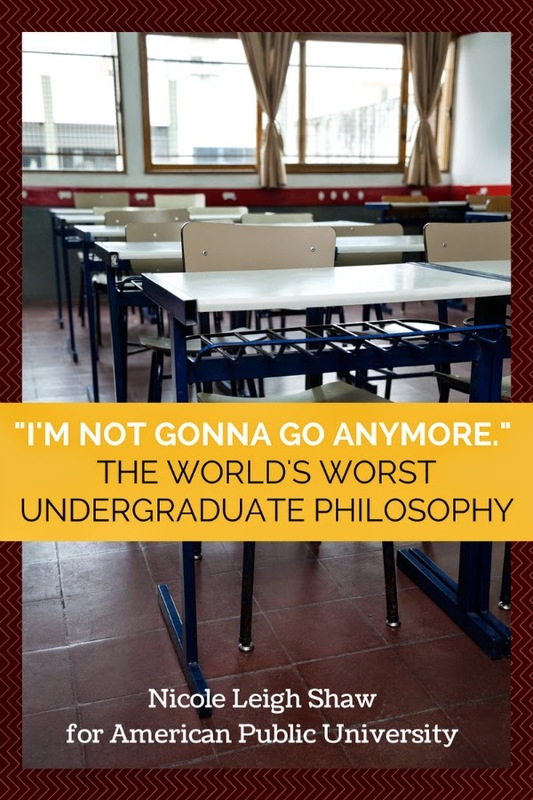 Don’t feel like there’s only one way forward in your quest for a degree or a certificate or even a class that interests you. Think outside the brick box. And never take a Friday class if you don’t have to. I will email you posts, everyone wins. Hey, get your own blog. Blog archive, evidence of typos. Nicole Leigh Shaw is a participant in the Amazon Services LLC Associates Program, an affiliate advertising program designed to provide a means for sites to earn advertising fees by advertising and linking to amazon.com, endless.com, amazonsupply.com, or myhabit.com.